When you mention the word “Vertigo” old movie buffs will immediately think of the Alfred Hitchcock classic starring Jimmy Stewart and Kim Novak. The ailment causes the characters to fall into a dangerous web of lies and deceit that leads to disastrous ends. Thankfully that’s fiction. However, the symptoms of vertigo are not and can be seriously disruptive to your quality of life. Symptoms can occur at any time and cause balance problems without warning. Vertigo is defined as “a sensation of whirling and loss of balance, associated particularly with looking down from a great height.” You can see how that might be problematic if you are on a ladder hanging decorations from the peak of the house or a tall Christmas tree. 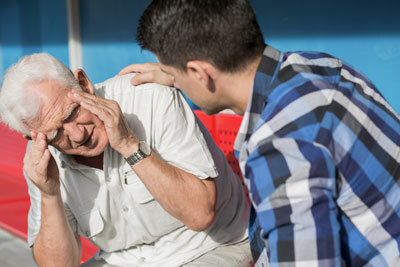 The number of people in the United States that are affected by vertigo is difficult to quantify because vestibular disorders (mostly disorders of the inner ear that affect balance) in general are underdiagnosed and, as a result, undertreated. The most current data we have is from 2001 through 2004 where 35.4% of Americans aged 40 years and older suffered from some sort of vestibular dysfunction. That’s rather significant. The data went on to indicate that dizziness affected 30% of people over the age of 65 and chronic problems with balance (lasting three months affected about 4% of American adults. In all, vestibular vertigo accounted for 33% of dizziness/vertigo symptoms. Is it dizziness, vertigo or disequilibrium? There are fine differences between the symptoms of balance disorders and we all tend to use their names interchangeably. For example, we may use the word “dizzy” to describe a spinning feeling and vice versa. When it comes to diagnosing vertigo, the more precisely you can describe what you are experiencing, the more information your physician will have while assessing your symptoms. Vertigo is also called BPPV, or Benign Paroxysmal Positional Vertigo and it is rooted in the crystals that line the balance center of the inner ear. These crystals help us to maintain our normal balance. BPPV occurs when these crystals – small pieces of bone-like calcium – break free and float inside the small canals in the inner ear. As we move our head in different directions, the dislodged crystals affect our balance and create the sensation that the room is spinning. When our head movement stops so do the crystals and the spinning gradually subsides. That is vertigo. BergerHenry BPPV doctors conduct a series of simple, sequential tests to diagnose the condition. The tests are non-invasive and take place in the comfort of our office. One test logically leads to another and helps you and our physicians to understand what is causing your discomfort. A BergerHenry BPPV doctor will discuss your medical history with you and conduct a thorough physical examination. An audiogram, or hearing test, will be conducted to ensure that no other inner ear abnormalities are contributing to your symptoms. If the evaluation leads to a diagnosis of BPPV as the cause of your vertigo, then a more specialized balance and vestibular test will be performed. During the test, you will be placed in sitting and lying positions while your head is moved in different positions to stimulate the symptoms of vertigo. If the test is found to be positive, the physician will perform an Epley Maneuver to treat the dizziness. An Epley Maneuver is a series of head movements performed by the patient while lying down, guided by the physician. The movements actually shift the balance crystals out of their dislodged position and into their proper position in the inner ear. It is a treatment that works very quickly. Vertigo can be dangerous if it occurs while you are perched in high places in the midst of holiday decorating. Let’s diagnose the cause of your balance problems to keep you safe. If you experience the symptoms of vertigo, dizziness or disequilibrium schedule an appointment with us so we can treat it.